Spring is a time of happy expectation. Of new growth and life, fair skies and sweetly-scented blooms and so in April and May we have the theme of Expectation. In Middle-Earth it is a time when the hobbits anxiously wait for crops and trees to sprout, or even a mallorn seed; when the Wold holds is breath for the first new foals to scamper. Lambs and fawns, and river otters on Anduin can be born in spring, but also babes of men. Perhaps an anxious father-to-be paces, waiting for news of a new arrival in the Great Year of Plenty. 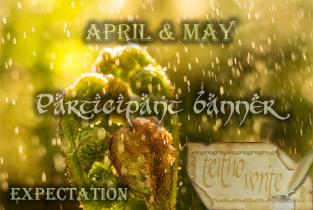 There are also many dates for expectation of joyous celebration, not least May 1s: , the anniversary of a King's coronation and a certain hobbit wedding. We expect because we trust. That can be that someone will or should achieve a goal, or behave a certain way. People can surpass our expectations or fail to meet them. A leader takes on a weight of expectation. How do they work to meet it or what happens when that trust is broken? Expectation can also be for something to happen in the future, either dark or light. A Tower Guard, hand on spear, might watch anxiously for sunrise over ruined Osgiliath. knowing one can only come to morning through the shadows' but what were his thoughts as he stood watch? What is it like for a Noldo to cross Belegaer and first glimpse Tol EressÃ«a? Foresight brings expectation that is imprecise but often hopeful as when Malbeth of Arthedain sees the Oathbreakers meet the heir of Isildur or Glorfindel foretells that the Witch-King will not fall "by the hand of man". As always in Middle-Earth one might expect adventures for it is a dangerous business going out of the front door.